So let’s look at caddis. The good old elk hair caddis has long been a favourite of mine as a dry / dropper fly, floating high with a wing angled upwards enough to see. But there’s another reason I fish them so much, trout will usually shun an emerger, dun or spinner that drags even to the slightest degree. 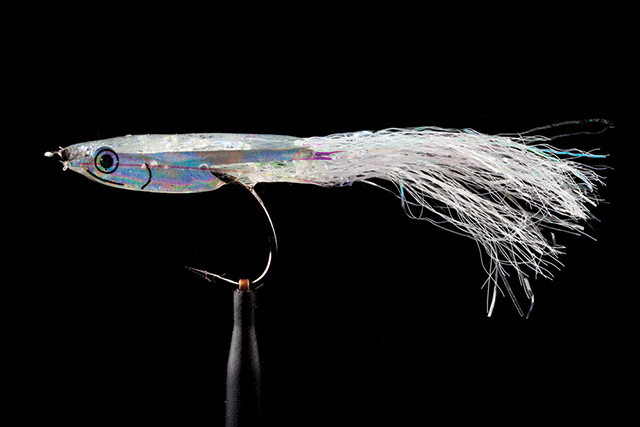 However, caddis routinely scatter across the current and so are a good choice for tricky currents and those who struggle with drag free drifts. Whether swinging after dark or presenting a difficult drift during the day it’s always handy to have a caddis or three at hand. Recently I received a message from Rob asking if he can learn to spey cast and successfully swing flies with his everyday trout gear. Here’s a secret: that trout rod you have in your garage will allow you to spey cast. 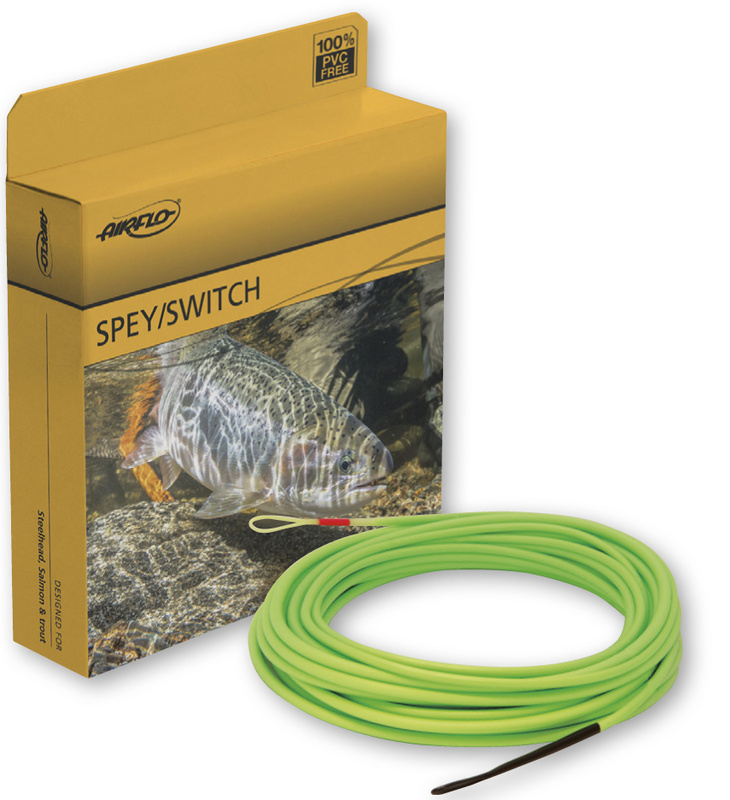 Spey refers to a style of casting, and this can be performed with any fly rod, single or two hand. 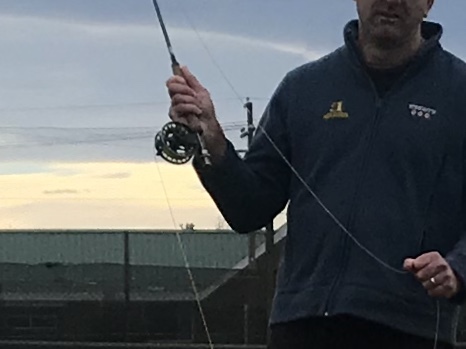 Specialist gear is not required, however in some situations ( tight surrounds, heavier tips and flies, sustained anchor casting ) a short skagit head will make life a lot easier. 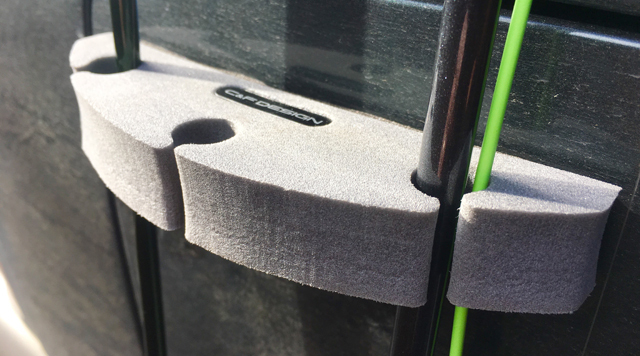 Longer rods will also make life easier, yet can prove heavy and clumsy and so this is where the shorter ‘switch’ style double handed rods come into play to allow more comfort and control with 10’ plus rods. 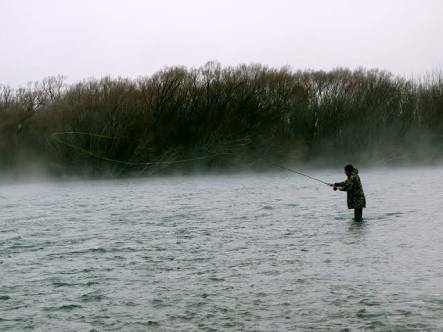 A standard long belly line will allow you to deliver woolly buggers and other standard wets at distance, and if you cant, you simply need to work on your roll casting technique. However there are times when you may not have the luxury of casting space or need to throw something a little heavier. It takes mass to move mass... or maybe you just dont have the luxury of getting out enough to get your roll cast legit. The Airflo Scout head is a short, dense, skagit style head packed with grains, speccing at 13.5’ / 150gr through to 18.5’ / 480gr. Short heads come into play when used on shorter switch rods or single hand trout rods and deliver your fly without the need for much, or really any casting space at all. 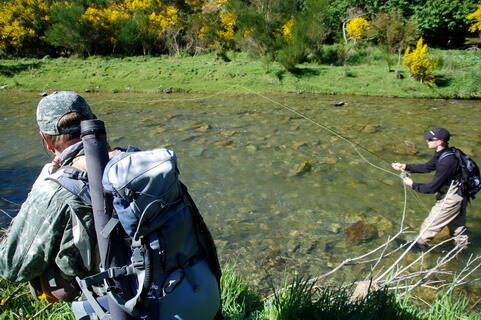 But the main benefit for me is being able to strip the fly closer into the rod tip than is possible with a longer head, allowing me to work flies through pools and along the banks in bush clad backcountry rivers. They allow me to send a decent cast from pretty tight places using flies that would require a pretty substantial D loop to move on standard, single hand fly lines. The Airflo scout taper profile allows for longer, smoother casts than many other modern, shorter heads and more versatility and precision when casting lighter tips. However my 250gr scout will still turn over a t-10 flo tip on my single hand 6wt, and I rarely need a heavier tip than that. You can loop on a flo tip to turn over bigger, or heavier streamers, or a 10’ polyleader for when more delicate presentations with woolly buggers and other standard sized flies are called for. 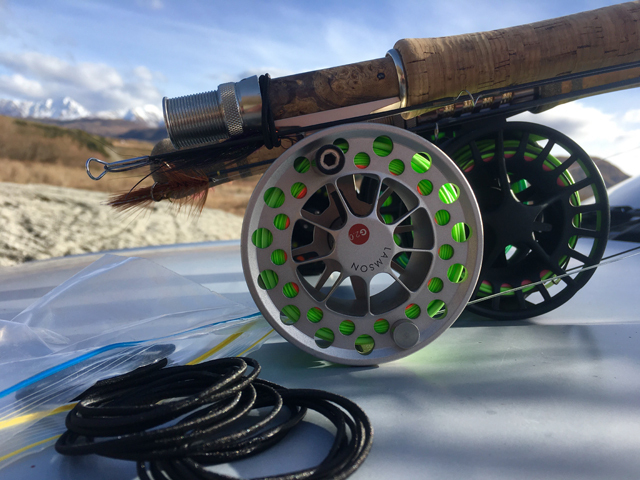 You may run a miracle braid running line for all round control and handling in colder conditions or choose a mono running line and shoot for real distance. 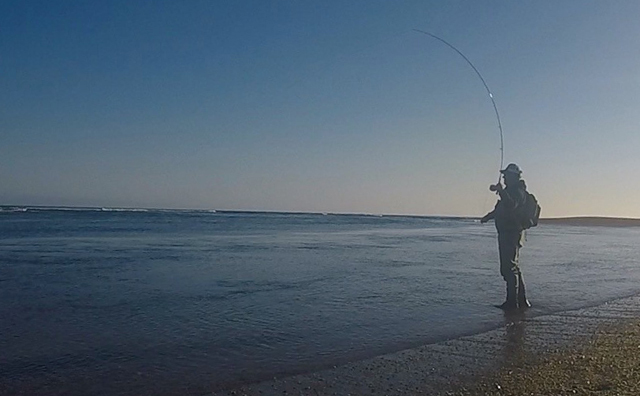 Overhead casting with the Scout and a mono running line is also very achievable, and can open up distance on larger stillwaters, and other big water scenarios. Heres a Tip: Cast at a higher forward trajectory with modern, short heads. Short heads have limited flight time as they straighten rapidly, and flat trajectory casts simply won’t travel far. Launched off an elevated trajectory they will still pull line once the loop has straightened to give you those precious extra yards. Ok, one more tip: Use much less top hand, and much more bottom hand to achieve a fast, tight loop and keep those hands close to your body & elbows in. A short, crisp compact stroke is required to avoid blowing out your anchor. Here's a clip that illustrates the importance of perseverance and considered actions when fishing to tricky trout. A load of instructional tips right here so sit back, crack a Moa and enjoy. Let me introduce “The Hang”. The purpose of the hang is to slow the retrieve in the final moments to let any interested fish catch up to your fly, and to pretty much dangle it in their face... if your fly is there, and the fish is right there, there are only 2 things that can happen right? Those both disappear as fast as your fly if you rip it out of the water too soon. 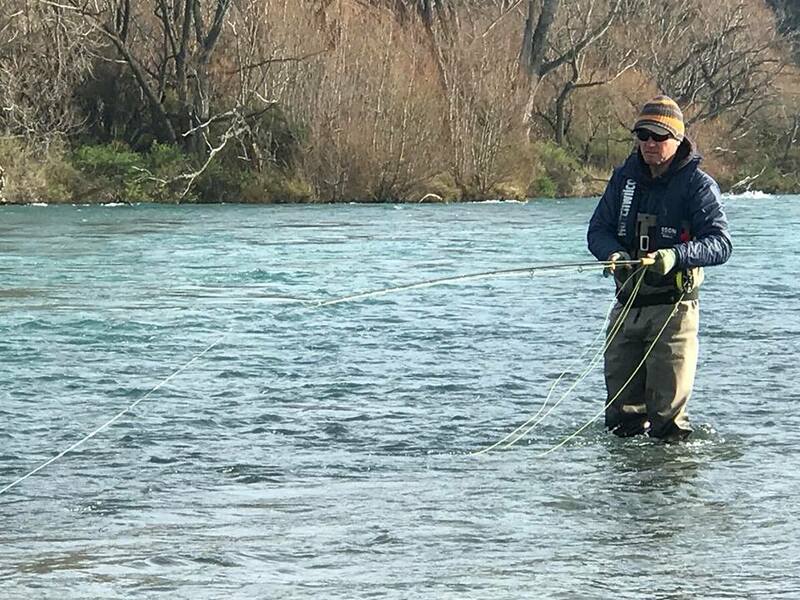 As the retrieve nears its end I replace the length, and speed of the strip by smoothly raising my rod tip, drawing the fly to shore as it slows. 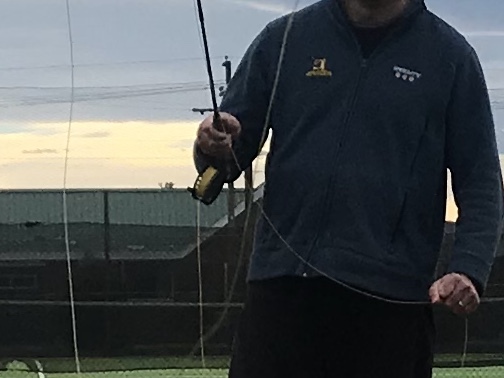 My hands remain closer together through short pulls in readiness of the strike: with the rod tip raised, the downward pull of my line hand is what will primarily set the hook. Once I can see my fly I pause, allowing it to hang momentarily and watching for any last moment lunges from the fish as it dangles seductively across the drop off. The rod is at a decent enough angle to instantly absorb the shock of an often savage strike. 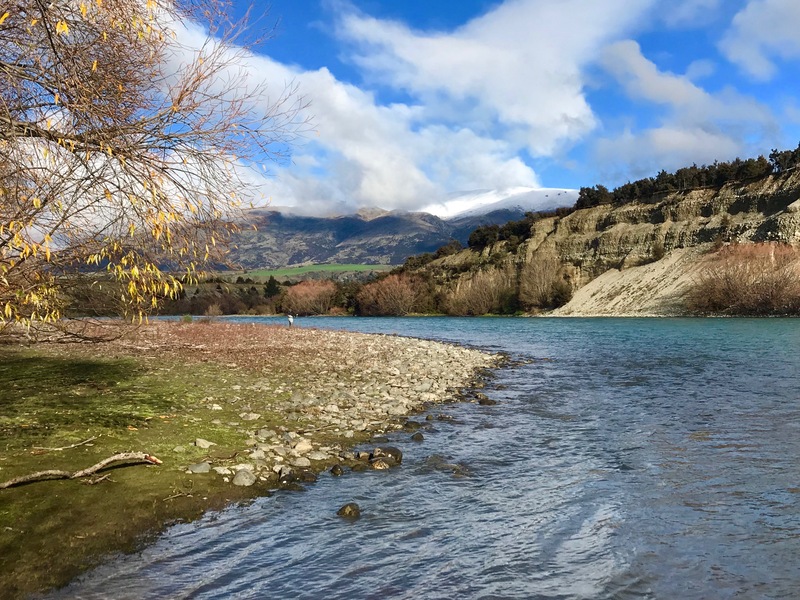 Line remains outside of the rod tip to load a quick cast if a fish does show and pulls away at the last moment: often a quick-fire drop of the fly in front of a retreating fish will create a 'half chance' rather than no chance at all. When you strike and bend the rod, you don’t want to pull the line / leader connection inside of the rod tip, no matter how smooth it is and instantly point load and snap your rod. Point loading is probably the most common cause of a broken rod. The little bit of slack created from the high rod allows the fish to take the fly in on a splashy eat. Often with a direct contact all you will get is a tug and no hook up. 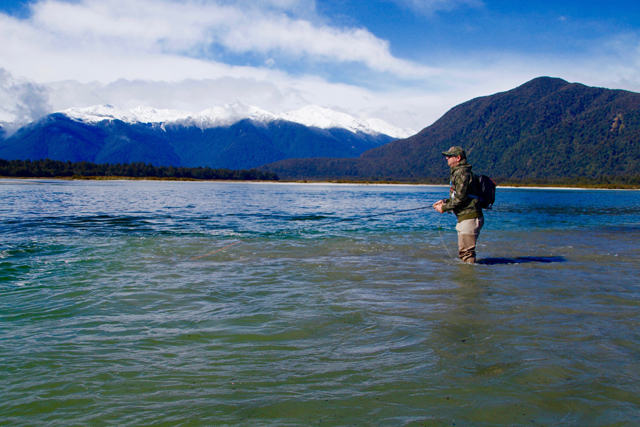 You simply allow any semi interested fish to catch up to your fly. Apart from all the above, hanging the fly keeps the angler more alert at a time where concentration often wavers as they prepare for the next cast. At this time of year, in big water, a missed chance could be the only chance. 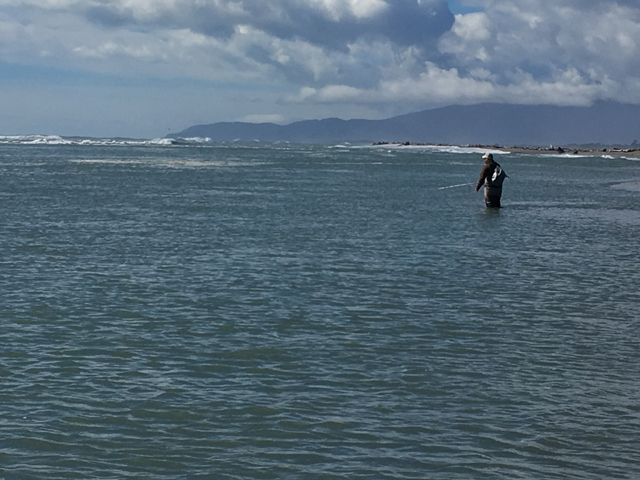 It's common for 'big water syndrome' to overwhelm many new to fishing our larger tidal estuaries, however it's not about blind chuck and chancing it. There are reasons some anglers consistently do better than others in big water and when those guys struggle, you know it’s been a tough day. Estuaries abound with structure, much like our upriver locations, and a wise angler will identify suitable structure and fish it accordingly. Channels, the drop offs submerged debris and the seams, gravel bars, islands and inflow all offer cover for predatory trout. 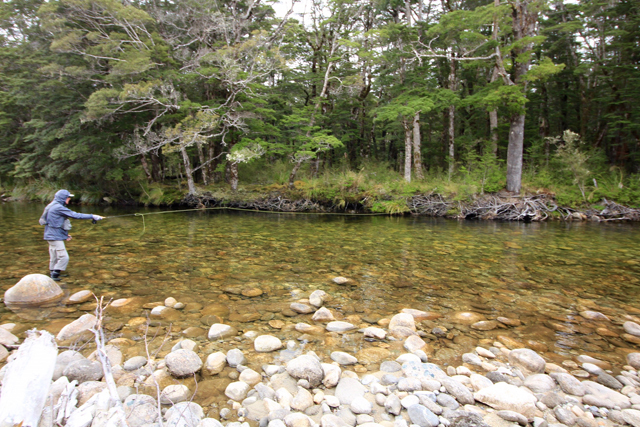 Often you will need to wade to teach such locations and a longer, controlled cast is of benefit here. When the tide pulls strong many baitfish will move out to the edges as they migrate upstream, where the currents are softer and are subsequently found in the eddies and calmer pools. Casting at a soft angle along the beach and retrieving slowly upstream is a productive tactic here. Beware not to be wading through water you should be fishing. Be constantly on the lookout for birds diving for baitfish, and always the swirl or movement of a trout. Missing a visual cue will cost you fish. A Simms wading staff allows you to safely wade the estuaries, feeling for submerged debris and drop offs while an Airflo 40+ or similar shooting head allows you to cover the distance quickly, and easily when needed. A good selection of flies of different profiles, colours and materials is desirable however if your fly is there, and the fish is there then they're usually pretty accommodating. Considerations should be made however for clear, bright and calm conditions and such days will often require different patterns than dirty, dark stormy days. A constant in all my patterns however are prominent eyes: as Clark Reid reiterated recently, eyes are an important visible trigger on baitfish patterns, especially in dirty water. A cellular phone (check coverage), Sat phone or other means of communication is a must when fishing tidal zones. It's all too easy to get into strife on some of our larger estuaries where the tide movements are unexpectedly extreme. That shallow trickle of a channel you crossed but 10 minutes ago may now have become an impassable tidal gut. The best of the estuaries are ahead of us as temps warm up, so get out there, put in the yards and enjoy the silvery rewards! Stripping streamers is one of the most efective methods of flushing out fish right? So why do so many spey anglers fish out the swing, then rip the line haphazardly back upstream in preparation of the next cast. I often take in a couple of strips then let it hang, then repeat. Maybe ‘pump’ the rod to add movement or move the tip wide to swing the fly away from the bank during the pause? Mindlessly stripping it all in anticipating the next cast will cost you fish. And we want to catch them all. So personally I'm not a fan of rods riding on bonnets and roofs, attached by a magnet or suction cupped contraption, holding on against the ever changing elements. There are too many trees around the tracks I drive, Suction lessens with time, moisture and temperature and road scum along with moisture weakens a magnetic grip. Simply wind your fly up to the rod tip, break the rod down in two, and loop a hair tie around both ends holding them together. Secure the more fragile tip to the cork to better protect it in transit. 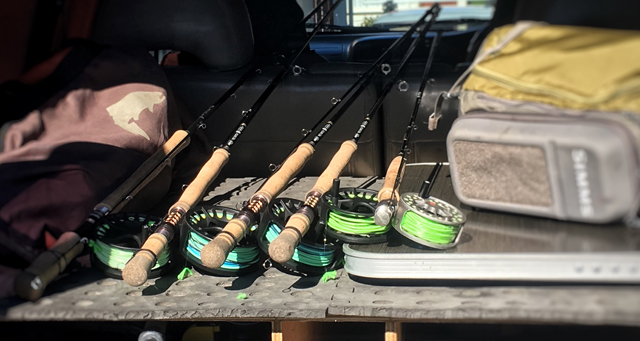 Rods piled in the truck wont tangle, and are ready to go as soon as you arrive at the river. I always keep a few hair ties handy in my vest for securing rods broken down into 4 pieces for long walks back to the car (its no fun losing a section somewhere along the hours hike back), for transporting rods safely in a heli, and whenever fishing with Jack Kos. However there are more bombproof ways to ensure your 4 piece rods stay as 4 pieces and are attached to the reel, ready to go and here Manic have your back. You're finally at the river setting up and unbeknownst your mates rod has slid off the car and is now underfoot... this wee doozie will keep your rods upright and problem free. Simple place it on the side of your car and slip the rods straight in. Theres no excuses for a breaking a rod this season in transit. Less time mopping up tears = more time fishing. A cool casting session with Tim today from the Otago Anglers Assn where I found him a very fast and accurate learner. On the initial casting assessment I identified a number of self-taught faults however by simply moving him into a more comfortable ‘three point grip’ he relaxed immediately, fixing his death grip on the rod, punchy application of power and utilising the wrist and forearm in a more natural, relaxed way. The tracking problem he wanted to work on simply disappeared. Forward cast... Notice the reel? Its easy to jump in and try to individually remedy every fault as you see them, but often identifying the main, underlying fault and working on this will bring all into line. The Airflo Forge is the silent weapon, and a worthy addition to your stable. With a heritage shared by the popular Platinum Chalkstream and Superdri Backcountry, the Forge is a price pointed flyline packing premium performance. 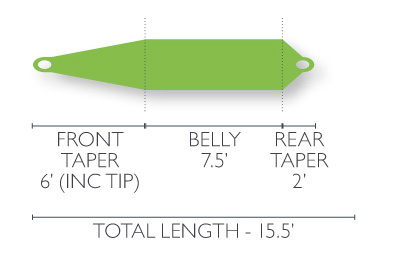 More on the aggressive side than the Elite presentation taper, the Forge delivers a non ridged, general purpose taper capable of supurb accuracy with those little dries we all love to throw, yet will bowl over a big stonefly or double tungsten nymph without a second thought. With a 40' head including an 8' front taper, and 7' rear boasting superb turnover, not to mention the benefits of Airflos Superdri technology, you have a higher floating, low maintenance line which will stay buoyant for longer, with durability and performance unmatched by plastic PVC lines. "A durable, high floating guide line, or line for those who switch scenarios daily between smaller waters requiring accuracy and presentation, to brawling backcountry rivers where long leader turnover is king. The two tone colourway from the sweet Olive head to the hi viz yellow running line lets you know where the head ends, and allows clients to nail the sweet carry length for turning over at distance every time. Throw in the reliability and performance of Airflos Superdri coating and you have a winner that wont break the bank." Don’t just fire out random casts thinking they will work. Identify structure in the water ahead of you and think about how your fly will present to fish holding around that structure. How fast / slow will the fly pass through the bingo zone and should it accelerate, remain uniform or slow as it does so? How deep / near the surface should it be. Will it present broadside or not? Should we add movement or just let it swing and once it passes that drop off and could we take a few strips, add a mend and have it slow as it passes that next big boulder on the swing? Fire me an email or check out my Winter Fly Fishing Options to book a session with Chris to get YOU fishing smarter this winter.